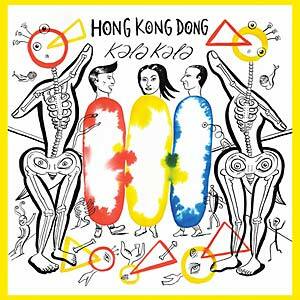 Hong Kong Dong is a quizzical synth-electronic band from Ghent formed by three distinct minds. Together they evoke a very peculiar and twisted sound. One of the gang members is Bolis Pupul who has released two EPs on Soulwax's DeeWee label. He is the band's synth guru and singer with a unique and delicate voice that flows like a horny tai chi master. He's also involved with other bands like The Germans, Charlotte Adigéry, and Wwwater. Sister Sarah Yu is the furious female singer and illustrator artist who brings with her the playful vibe of a child tossing around a Play-Doh microphone. The man behind the tweaked beats and guitars is Geoffrey Burton, the maestro guitar player/producer who prefers to make his guitar sound like a synth or a cracking bird. He's been around for some time now, earning his place in bands as Arno, Daan, Alain Bashung, Sophie Hunger, and Misia.